Mamak is a cheerful splash of red on Goulburn Street, a slick and stylish eatery that is filled with Malaysian students on a Saturday night in Sydney. Mamak refers to the cuisine of the Tamil Muslims of Malaysia, whose 24-hour snack stalls usually include flaky rounds of roti, meat-filled murtabak, nasi lemak and mee goreng. There are no bookings taken here, but our group of eight manage to grab a table just after 6pm. Throughout the evening we note the constant queue of people out the door. The staff are all smartly dressed in black t-shirts and pants; the wooden tables are shiny with laquer. It's a happy bustle of people tonight, groups of students, clusters of friends and the occasional family sharing a meal, the children meekly perching on the edge of their stool. 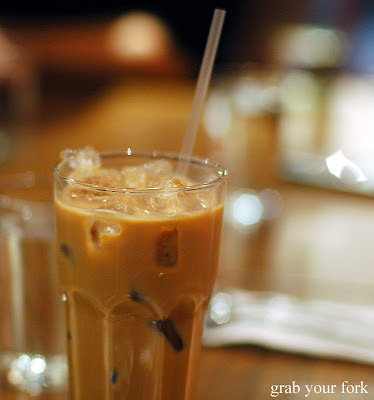 Our drinks mainly comprise of teh tariks, the Malaysian sweet tea aerated by pouring from a great height from glass to glass. I order the teh halia ($3.00) which promises a hint of ginger. It's refreshing and sweet although I wish the ginger had a bit more kick. 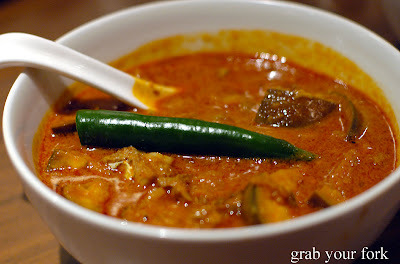 Kari ikan fish curry arrives in a generous-sized portion that is instantly aromatic. Chunks of fish are soft and tender, the curry is sweet, salty and a tad sour. The thick tangy sauce is delicious on rice ($2 per person). 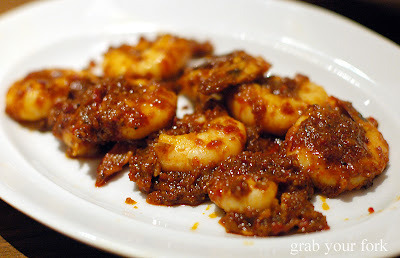 The sambal udang prawns look a little naked on the plate (a bit of greenery required perhaps?) but they are reasonably plump and smothered in sambal. The sambal is more a warm hum than the promised fire, but I take delight in scraping the remainder of the sauce on my rice regardless. 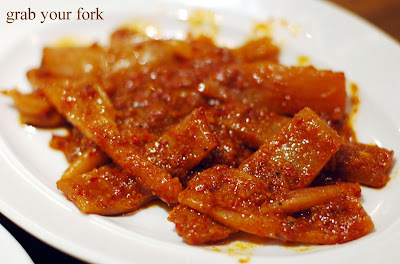 We also order the sambal sotong, strips of calamari that are surpisingly crunchy, as if they'd been dried and rehydrated. 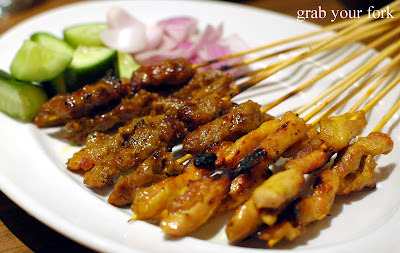 The satay sticks are swooped on by the crowd, thin strips of beef and chicken cooked over charcoal until caramelised and smoky. 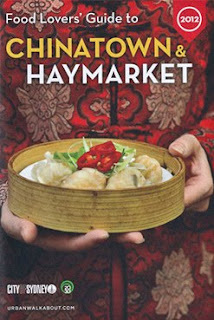 It arrives with chunks of cucumber and red onion as well as a deep bowl of satay sauce. 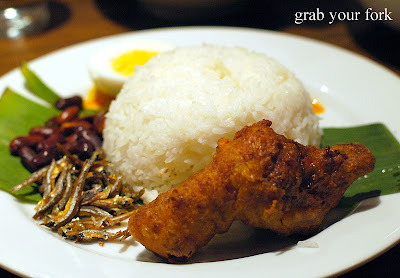 Nasi lemak as a prettily plated ensemble of coconut rice, fried chicken, boiled egg, anchovies and dry fried peanuts. 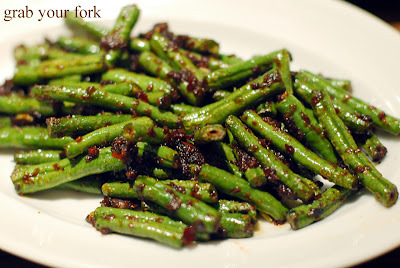 We order both versions of the belecan, one with kangkung water spinach, the other with kacang panjang snake beans. Both make use of belecan, a fermented shrimp paste that is traditionally feisty in nature, potently hot, sweet, garlicky and decidedly fishy. Again we find this rather mild in temperature. There's only one vegetarian dish available on the menu, kari sayur vegetarian curry that is totally sold out, we discover to our dismay. 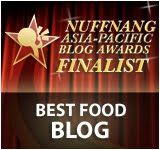 The only alternative, our waiter advises, is the rojak Malaysian salad minus the prawn cakes. The lack of vegetarian options surprises me, but the rojak is tasty if a little rich, what with the fried tofu drenched in rich satay sauce. The roti is one of the last dishes to arrive, two young men on roti duty busily frying out the front. The roti is soft and feather-light, although not as crispy and flaky as I'm used to. We tear off small pieces and dip them into the curry dips and sambal provided. 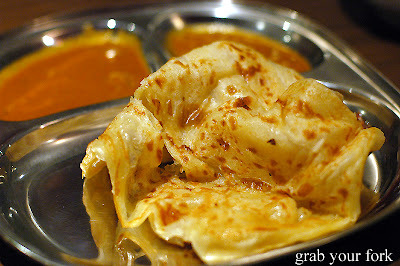 We also order the roti bawang ($6.00) which arrives as four roti pockets folded into quarters and filled with thin slices of Spanish red onion. 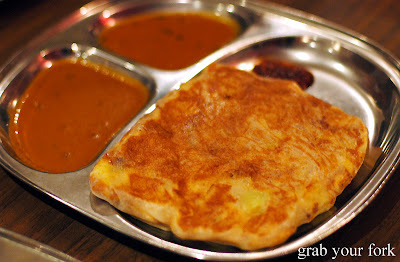 We order both the chicken and the lamb murtabak, a roti crepe that holds a mixture of meat, eggs and onion. This version is more omelette-like, both the chicken and lamb encased in a thick padding of beaten egg. The dessert train pulls out with two traditional desserts. 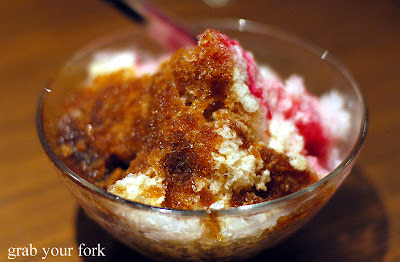 Ais kacang is sweet and refreshing, a mountain of ice atop cubes of grass jelly, sweetened red bean and corn kernels. 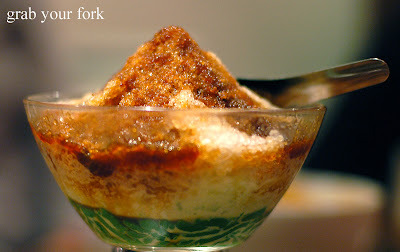 The cendol is topped with a ladle of coconut milk that is saltier than usual. Just as well the gula-melaka is sweeter than usual too, although the palm sugar crystals are crunchy on the tongue, rather than a thick caramel syrup. Roti kaya is a crowd pleaser, a dessert version of roti with its heart of pandan and coconut jam. We're happily satiated until we see the roti tisu sail past, a giant upside cone of roti that towers with great spectacle on the plate. It's amazing how much the appetite can grow. I have been eagerly waiting for this eatery to open. But from the sound of your review, it's not up to the standard of a 'traditional' Mamak eatery, but rather catering for the local Aussie taste bud? Did the satay dish have the option of the coconut rice cubes? 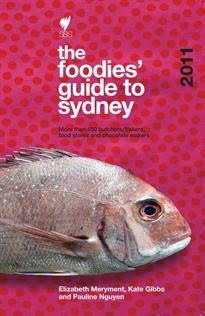 Now I'm wondering whether it's worth the trip into the city to try. when i was in singapore, i loved their indian rojak - is that the same as the malaysian type? 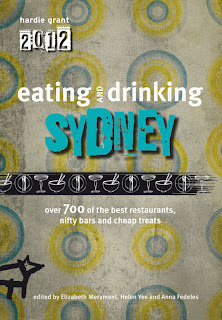 if not, do you know where they would have indian rojak in sydney? looks and sounds pretty good. how does it compare to kompitam and alice's which i've tried? 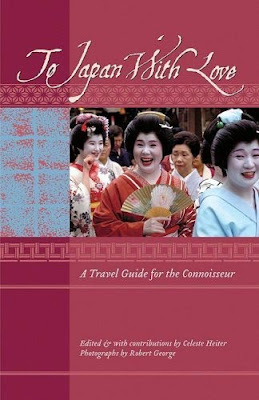 i hope to check it out soon with my camera in hand. Hi \/b - I can't say I'm an expert on Mamak eateries, but I was disappointed with the lack of heat, especially since the menu promised "fiery". I would recommend you try it firsthand yourself though, and would love to hear your feedback when you do. Hi Simon - I preferred the kangkung belacan and prawn sambal from Kopitiam - both were stronger in flavour: salty, sweet, garlicky and hot. The roti from Alice's is hard to beat I think. I do like the fact that Mamak has a good dessert menu :) Would be keen to hear your take on Mamak too. Finally a place where we can have a nice teh tarik in sydney!! i know it's popular in malaysia, which might explain the use of this particular variety of squid! Hi Anon - The sambal udang did look a little sad on the plate. Some green leaves would've pepped it up a little, I think. Oh wow, the prices are pretty costly i say. 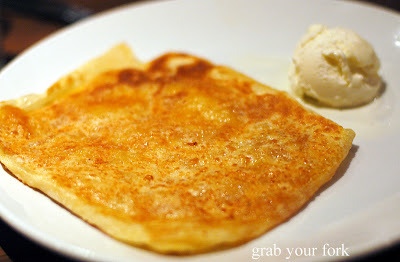 Especially the Roti Canai. $5 bucks, in Singapore we can get like 5-6 pieces. Hahha. 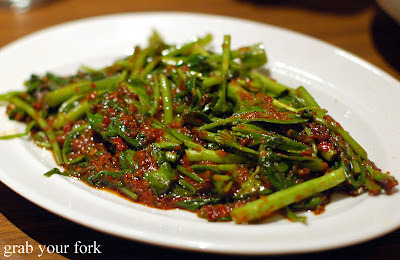 Well personally i think the kangkong is a must-have especially when you eat with hot steamed rice. goodie! For the Rojak, that's more like Gado-gado in Singapore/Malaysia. 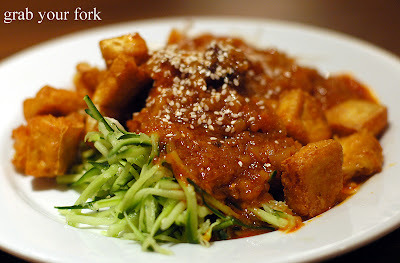 Rojak is usually served with shrimp paste + peanuts, and more darker and thicker sauce with a squeeze of lime juice. Produce quite a stench though. Being from malaysia i can tell you that this place has the most authentic roti in Sydney. It is also the only place which makes it fresh and not using the frozen prepackaged pieces. Then again i find most of its food to be on the average scale. I will probably visit this place a dozens times though as this is the only true mamak stall we have here in sydney. AT ten times the cost of course. Hi Wana - Oh I'd love to go to Singapore. The food looks so great and so cheap! I like the sounds of a darker fishier rojak too. Sounds great. Hi renditionwmc - Thanks for your feedback. Always great to hear a local's take. Hi Mama Bok - The place is very busy! And yes all the clientele looked very happy! Greetings from London (Lisbon tomorrow - Pasteis de Nata galore!!). I went to look for mamak before I left Sydney but it didn't seem to yet exist at the Goulburn St addy so I'm glad that you've put it back on my radar. Shall try it when I get back! I was so dissapointed after trying Mamak. I was really looking forward to fish curry with okra, tomatoes and eggplant. But when it arrived, it was lukewarm and there was no okra, tomatoes or eggplant. I also ordered nasi lemak with chicken curry which was fine except that the curry served was two measly pieces of chicken on the bone, which had little meat on it at all! plus it was cold! i must admit the roti was really good and satay was pretty tasty. I would go back just for the roti! Hi aptonym - Lucky you! I still dream of those still-warm crispy pasteis de nata dusted with icing sugar. Would love to hear your thoughts on Mamak too. You must try it on your return. Hi Anon - It seems that the roti is indeed the star of this joint. It's a shame about your fish curry - ours was very good.